Should Publishing Embrace Misfits and Outlaws? Read one of my recent hit pieces for Publishing Perspectives in full below or the original by clicking here. Perhaps we should stop trying to learn lessons from the likes of Elon Musk or Jeff Bezos and instead turn to figures such as the 18th-century English pirate Blackbeard or the late young hacker Aaron Swartz. After all, Blackbeard “disrupted” the Royal Navy through innovations such as creating terror by his appearance rather than through violence and the egalitarian treatment of his crew. Writer, programmer and “hacktivist” Aaron Swartz created an early version the web feed format RSS at the age of 14, was a leader of the anarchic social news site Reddit (which became a focus for online activism), and his final act was to write a program whose alleged goal was to download 4.8 million tax payer funded documents from the subscription-based academic research database JSTOR that he believed should be shared with the public for free. 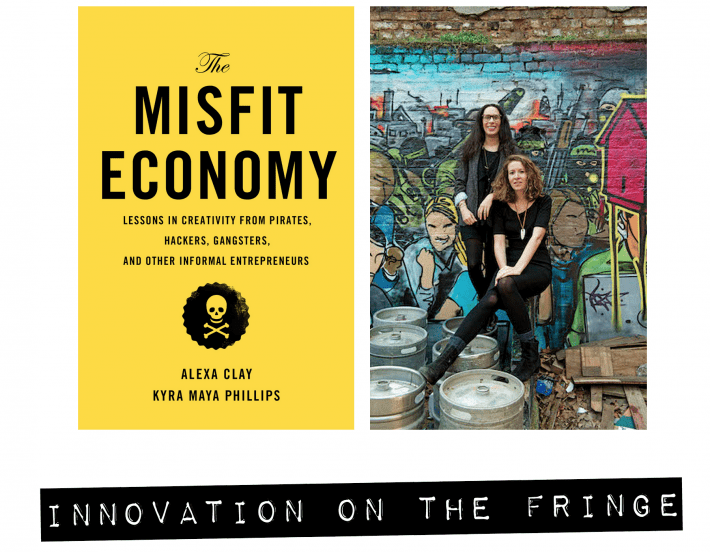 This is, in a nutshell, the argument made by Alexa Clay and Kyra Maya Phillips in their new bookThe Misfit Economy: Lessons In Creativity From Pirates, Hackers, Gangsters, and Other Informal Entrepreneurs. The misfit economy is an economy that is all around us but which we don’t always see. It is an economy that covers numerous different kinds of activity, from the informal and legal, such as the American camel farmers who worked together to sell unpasteurized camel milk, through to the clearly illegal — such as the Somali pirates who hijacked the Ukrainian freighter MV Faina in 2008 and collected a $3.5 million ransom. It is also an economy that is about hacking, hustling and pivoting when things don’t work out — and it is an economy about real-world issues that is born out of the need to survive. Although the idea of the entrepreneur as some kind of an outlaw figure is a familiar idea, Clay and Phillips argue that while entrepreneurs and misfits may share similar traits, such as being natural risk-takers, they shouldn’t be confused as their traits are not identical. Misfits are also countercultural, self-questioning and vulnerable. Do Misfits Fit Into Organizations? But do we actually want to be a misfit in an organization, since usually that is the moment to update our LinkedIn profile? It is worth pointing out at this point that Blackbeard met his death in a savage fight with the Royal Navy and that Aaron Swartz tragically committed suicide after pleading not-guilty to a federal indictment for data theft and perceived victimization by the US Government who were threatening him with 35 years in jail and a $1m fine. According to Clay, where the lessons of the misfit economy particularly can pay off is with those who are starting and managing organizations in industries like publishing. “There is a lot too that established companies can learn from misfits,” she says. “From 18th-century pirates to hacker collectives, misfit subcultures we studied were built on egalitarian principles. If you are starting and managing organizations, learning how to harness the entrepreneurial potential of employees and enabling greater self-governing behavior amongst employees is key. Phillips agrees that the rise of the misfits is not about being post-capitalist, as she argues that even the so-called collaborative economy is still at its heart capitalism. It is about something much more basic than that. Previous Divine Eagle: How much of a threat is China’s new high-flying drone to US air superiority?